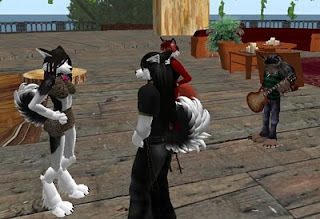 In the Summer of 2007, I had started giving Second Life another look after a small start of just logging on occasionally and puttering around. I found a place to hang around at: Luskwood. 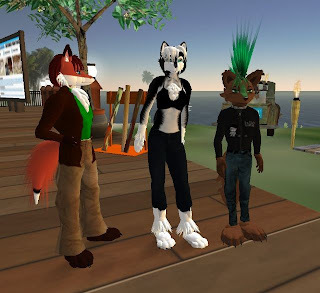 I decided upon a new avatar to replace the starter ringtail I’d been wearing which back then marked one as a newcomer: the Lusk red fox, and I was starting to find interesting places after getting the idea to look on the Internet for Second Life websites. I made a few friends at Luskwood. There was Lomgren who’s 6 inch avatar never failed to draw attention. There was Hervy the squirrelgirl, whose avatar had gotten a few seconds on CNN when a politician gave a talk on Second Life. And after some time, I came across another I became friends with, Kara Nakamori. At the time I ran into her, Kara was in the freebie purple catgirl avatar that was popular at the time. She stood out from everyone else with the friendliness and enthusiasm, and we ended up friending one another. In real life, Kara was a Japanese-American whom had lived in Texas since moving there as a little girl. She was a student in college. She once showed me a photograph of herself, a quiet girl. I never did hear her voice, her telling me she felt a little embarrassed by it. We met a couple more times at Luskwood, and then she invited to teleport to somewhere. I found myself in a place with a number of cafe tables and chairs, with a stone fence around. Kara introduced me to two friends of hers, Blarion and Keli, and told me this place, the STA or Student Travel Association, was a hangout of hers. They soon introduced me to the two who ran the place, Euranna Rossini and GlobetrekkerBob. Anna and Bob were normal humans, as were the rest of the staff there. Bob stood out with his sunglasses, denim vest on a T-shirt, and hat. And in the STA website, pictures of the real-life Bob had him in his hat and sunglasses as well. The STA was two sims, the east a building showing what the real-life organization was about, and the west a sandbox/newbie help area/social hangout. My friends would sometimes spend time building in the south, and attending events in the north. But we often hung around the center of the sim at the cafe tables around the globe, chatting about goings on, occasionally remarking about the newcomers arriving and walking around as they read the “Welcome to Second Life” signs instructing them on how to go around and giving them a few clothes and useful items. There was a small staff there most times to be there if they needed help. Occasionally the newcomers would have a question for us, which we answered. We were occasionally asked about our furred avatars, and we answered their questions. There was only one occasion someone was rude to us about them. Time went on, and there were a few changes. Kara put away her freebie av in form of a black and white huskygirl avatar. She told me this look just seemed better for her than a vixen or wolfess. Blarion started out with a skunk, but switched to grey wolfboy. Keli was briefly in a Luskwood "jogi," but changed back to his coyote-like tan-furred avatar. It might have been one of the “Crux” avatars, but not sure. Anna would wear different dresses. O’l’ Bob never did change. Myself, I got a vampire bat for Halloween, which I wore for about a week before putting it away and going back to foxy. Blarion soon got a job as one ot the STA’s DJs, with Keli pulling host duty. Keli never had his own tip jar, as Blair insisted on splitting his take with him fifty-fifty. Bob and Anna invited the four of us into the STA staff, as we were already helping out the newcomers. One of the titles to the group was “Traveler,” which I liked as I was exploring time to time, and it became the one I wore the most. Other STA group members close to us that were practically in included Otis, a self-described “gangsta” with tattoos whom was the other DJ besides Blarion. There was August, with her flowing red hair, whom liked to dance. There was Sparklin Indigo. And there was Ayern, whom was always there with a smile. There were a few small problems. There was one guy whom somehow got a picture of Kara and Kana at a party. Apparently, he was showing it around, much to Kara’s embarrassment as she was a little shy. Then there was the incident in which someone was rather rude to us, continuing to call us “freaks.” Fortunately Schism was able to shock him so badly, the pest ported away. One of Bob and Anna’s friends was Sean Voss. He was an avid explorer of Second Life, even publishing a book in real life about the best locations in the Grid. He did weekly tours of places that caught his interest, and we joined and went on the tours, Blair and I being the ones who showed up the most. Sean helped me find a number of places for articles. In November, I joined Second Life Newspaper, and I now had a steady source of income. A few more tips for Blair, and some of the cartoons I sent to the newspaper came from here. Later that month, the STA hosted an art show, so I was able to feature my hangout in the news. Talking to the artists there, Kara and I found a photographer whom took what became our profile photos. The happy times continued to December. We continued to make the STA our hangout, but still explored around some. Kara, Schism, and I occasionally took a peek back at Luskwood, the others not so much because of the lag. Soon came Christmas and New Years. These were good times, swapping a few small presents, talking about what we got in real life. And with January came the new year, 2008. We went about as before, meeting up and hanging out, exploring, going to parties, such as the ones my newspaper then was holding, and otherwise having a great time. One of the STA staff, Sparks Indigo, started up a small club in another sim. It seemed there was no end to the good times. Then on January 25 came a shock. The STA organization canceled it’s support for the two sims Bob and Anna ran, and gave us only a few hours notice before the place was set to de-rezz. Stunned, my friends could only hang around until the end, porting to someplace nearby after it was gone. I logged in after work to get the news. It was truly a shock. Our hangout, our home in Second Life ... gone. Kara was almost in tears. Then came more trouble. Kara had a stalker. It seems Kara met up and befriended someone at Luskwood months earlier just before his computer went kablooie, and somehow he had interpreted her words of kindness as romantic intentions over the four months he was saving up for a new computer. And when the shocked Kara tried to explain that wasn’t her intention, he went ballistic. Eventually Schism was able to talk some sense into him. But the damage was done. Without the place she had known as home in Second Life for months, with her sense of security shattered, she told the rest of us she would be leaving, at the least for a few months, but possibly for good. At a hollow tree at a sandbox which had become our new hangout, she gave each of us a hug, and logged out. With Kara gone, it was like the heart of our group was gone. Her roommate Kana still logged on, saying Kara was busy with college. At one point, Texas was threatened by a hurricaine. Kana told me she and Kara ended up having to spend a few days with family deeper inland. We continued to hang out at the sandbox tree, having a few parties at Spark’s club. Bob never returned to Second Life. Anna built a flower shop, which remains open to this day. We began hanging out with a bunny couple, Fortunas Sands and Caleia whom ran another club, the Fortelia club. But unfortunately troubles soon forced them to close, and Sparks soon had to close her club as well. Kana herself became a builder, showing up often in a macro av, leading to a few “fifty foot woman” jokes. Finally in May, Kara returned, which was joyous news. But it didn’t last. After a short time, she told us she was going for good. Summer 2008 was the last time I saw her avatar to avatar. I saw her log on a few times after that, but never got an answer to my IM greetings. Kana soon left for personal reasons, and then the group began to slowly drift apart. We were meeting less and less. Balt became the only one I met up with more than rarely. My work as a reporter on the Grid kept me going on my business, and eventually the road would take me to other friends, and new hangouts and homes. But I never did forget Kara. She once told me shy as she was in Second Life, in real life she was worse. She told me if I ever greeted her hello in her real life, she’d just shy away. 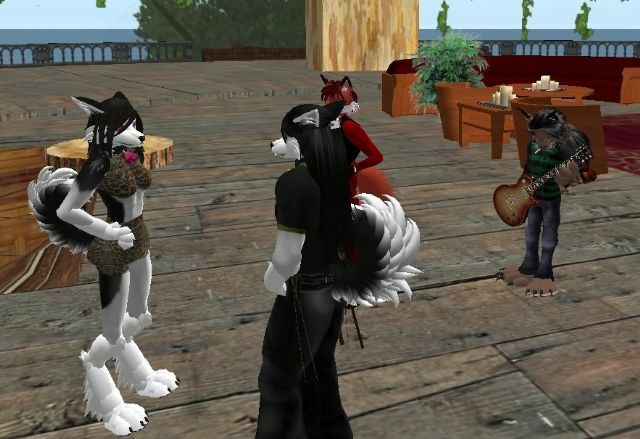 But one as involved in Second Life as I am, I never did forget my first good friend here. Someone whose bright smile and cheery manner helped encourage me to be more involved here, and start on the road which took me where I am now. Here’s to you, Kara Nakamori.